PRODUCT: EasyGate HG SECTOR: Education CLIENT: Darlington College LOCATION: Darlington Darlington College has a long history of serving the educational needs of the local community, founded in 1897 as the Darlington Technical College, before relocating to a central campus and being rebranded as Darlington College in 2006. Today the college provides education and training to thousands of students and businesses each year. As well as delivering a high standard of education, the Darlington Campus provides modern state of the art facilities for the students which include a £2 million renovated construction centre, media design centre, motor vehicle body workshop, a university centre in partnership with Teesside University and much more. 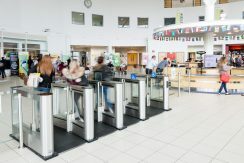 With all these state of the art facilities in place, the college needed to ensure that only authorised staff, students and visitors were able to gain access, an effective entrance control solutions was required. As a leading provider of anti-tailgating entrance control solutions Meesons were approached to advise on the different options available. 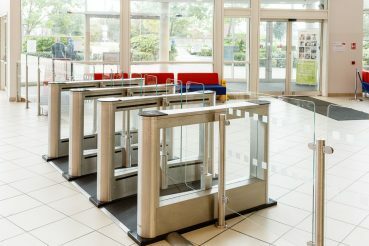 The college wanted to maintain the open feel of the reception area whilst ensuring that only authorised staff, students and visitors were able to transit past the main reception to access the wider facilities. 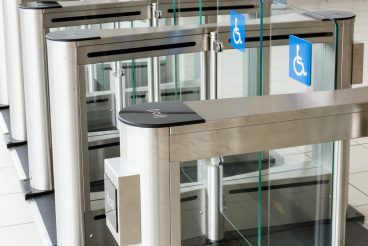 Meesons therefore recommended installing the EasyGate HG Speed Gates with 1200mm high glass wings to retain that open feeling, whilst making it harder to climb over the Speed Gates. 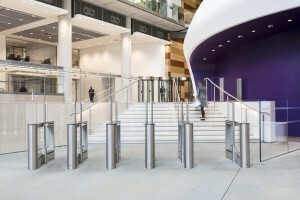 Due to the circular design of the reception area and the reception desks central location, two banks of Speed Gates were required to manage the flow of users to either side of the reception. These consisted of six standard width lanes and 1 wide access lane. Post mounted glass infill barriers were also supplied around the Speed Gates to create a secure line to prevent unauthorised access. 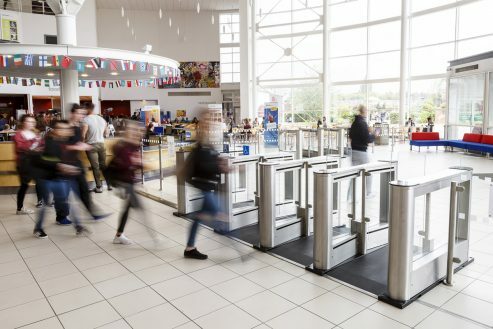 As it was not possible for the Speed Gates to be securely fixed into the finished floor, Meesons provided the Speed Gates on Equality Act compliant low profile anti-slip ramps, removing the need for any drilling or damage to the existing floor. At the clients request the Speed Gate cabinets were provided in a Brushed Stainless Steel finish to create a modern look. Following the initial installation the client requested a modification to the cabinet of the wide access lane to integrate a low level access reader to assist disabled users. 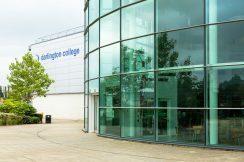 After the completion of the install Darlington College appointed Meesons to handle the service and maintenance of the Speed Gates.